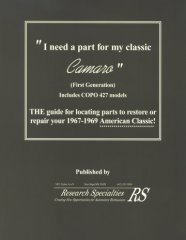 THE guide for locating parts to restore or repair your 1967-1969 American Classic! Back in print after MANY years! 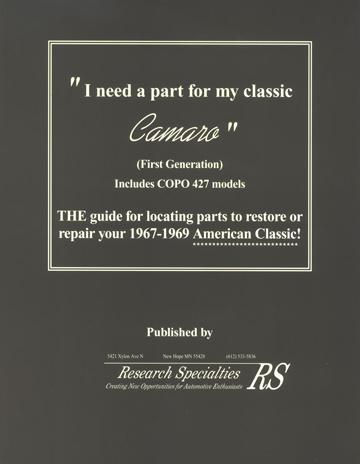 This book contains parts interchange and identification listings for all major components and assemblies of 1967-69 Camaros INCLUDING THE COPO 427 MODELS! : engines, axles, transmissions, brakes, steering, suspension, springs, electrical systems, cooling systems, fuel systems, heating, air conditioning, wheels, wheel covers, recyclable body components and assemblies. Additional topics include: engine application and identification lists, axle identification lists, elementary VIN and serial number decoding and insights into locating and purchasing parts. It's completely indexed, and also features explanations of format and vehicle models referenced. 8 1/2 x 11", softbound with 208 pages.